Our popular two-page bulletins on the subjects ranging from making color-themed container gardens (including prep for flower shows), to starting tasty vegetables from seed, to the whys and wherefores of using native plants in your garden are now available for free download. Just click on the link(s) below. The documents will download as color PDFs, 8.5 x 11, ready for you to print. Garden Club of Irvington Horticulture Co-Chairs Renee Shamosh and Ellen Shapiro recently met with other Horticulture chairs of GCA clubs in New York State at the glorious Brooklyn Botanical Garden, where the fields of bluebells were in full bloom . The representative of each club shared a horticulture tip, which we are sharing with you. 1. Buy and read the book, The Well-Tended Perennial Garden. 2. Another excellent book is How to Prune Almost Everything, which covers trees, shrubs and vines. 3. Grow anything in winter indoors under the new CF light bulbs. 4. Plant Russian sage as a barrier against deer. 5. Neptune seaweed-fish fertilizer is great for plants and helps keep pests away. 6. Fertilize with milorganite, which helps keep deer away, too. 7. Homemade deer repellent recipe: In blender, blend one dozen eggs, 2 cups hot sauce, and a few drops Dawn dish detergent. Let putrify for three weeks and spray on plants at beginning of season and after every rainfall. 8. Lee Valley windowsill seed starters are great. 9. Cut weeds, don’t pull them. Pulling only spreads the seeds in the soil and makes more weeds. 10. Don’t mulch too much. Fill your beds with plants so there’s no space between, or put another way, use plants to smother weeds. 11. Plant wild arugula. It’s delicious. 12. Excellent plants for dry shade include mahonia, an evergreen shrub. Underplant it with lamium. 14. Keep a garden journal. Discipline yourself to write in it once a week. 1. Choose your favorite delicious, ripe, heirloom tomato. 2. 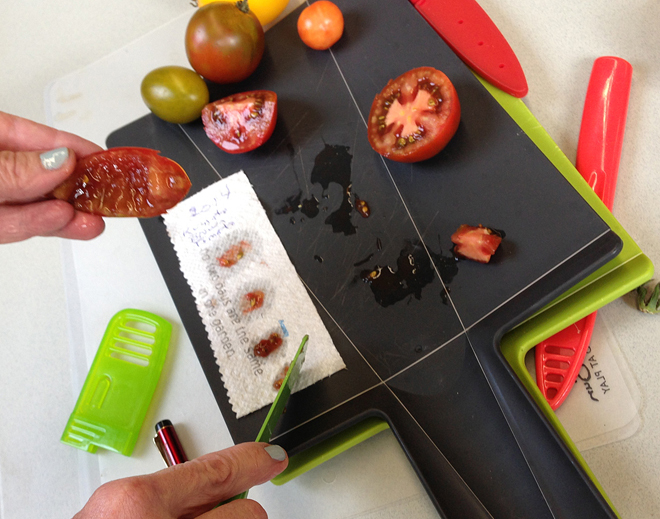 Cut the tomato, removing the seeds and the pulp together. 3. 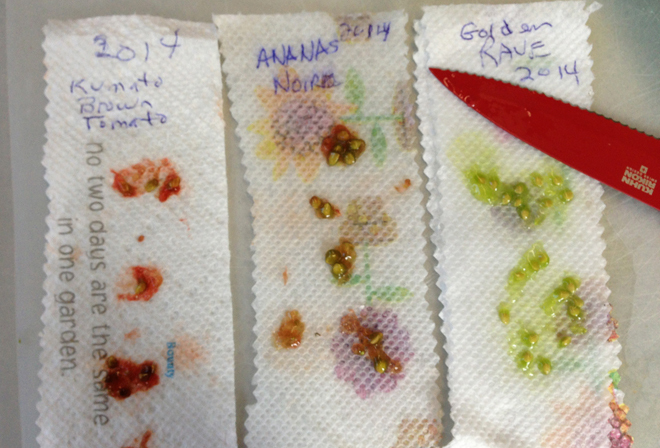 Put the pulpy seed mixture on a strip of paper towel. Label with the year and tomato variety. 3. Allow to air dry a day or two at room temperature. 4. Roll up strip of seeded towel, and place in a paper envelope, adding the date and variety. 1. Pull the seeds off of the towel and plant outdoors in a sunny location when there is no danger of frost (I plant in a seed starter mix from Gardener’s Supply). 2. When you have a set of true leaves, pot up your seedlings into small pots. Make sure to harden them off, gradually acclimating them to outdoor conditions, by increasing the time outdoors a little each day. 3. When the seedlings are about 6″ tall, plant them in a garden bed or large patio pots. “Your plants will forgive you for pruning hard. 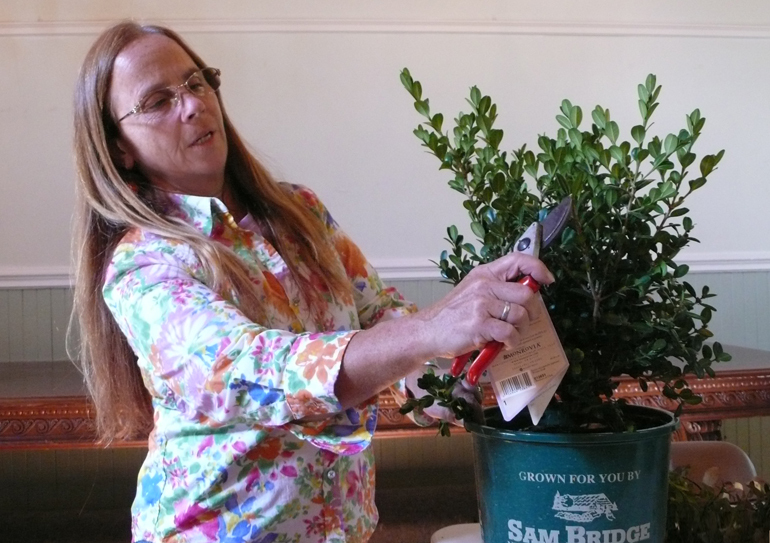 They’ll come back and do much better for you.” These were words of advice from Mary Jo Bridge Palmer, the owner and retail manager at Sam Bridge Nursery and Greenhouses LLC, a full-service garden center in Greenwich, CT, who gave a demonstration to GCI members and guests. • There are three reasons to prune: 1. to remove dead or broken branches; 2. to control height; 3. to improve flowering. • In late fall, prune the plants that flower in the summer and fall. The list includes butterfly bush, trumpet vine, oak leaf and P.G. hydrangea, magnolias, hybrid tea roses, and summer-flowering spirea. • Go inside overgrown shrubs and thin the oldest branches out to let in light and air. • Use a bypass pruner with a rotating head. • Use Wilt-Pruf on broadleaf evergreens in November and again in January or February. • Prune spring-flowering shrubs right after flowering. Don’t be afraid to prune lilacs to the ground in spring and nip other deciduous shrubs to give them shape. • Keep a journal — jot down what works and what doesn’t. Mary Jo earned a Professional Floriculture certificate from the Ratcliff Hicks School of Agriculture at the University of Connecticut. She has taught for Greenwich Continuing Education and the New York Botanical Garden. A former president of the Westchester and Fairfield Horticultural Society, she is on the board of the Perennial Plant Association and serves on the Greenwich Architectural Review Board. She received the Garden Club of America’s “Significant Contribution to Horticulture” award in 1995 “in recognition of the knowledge and love of horticulture she shares most generously with all. The event, like many monthly programs of the Garden Club of Irvington, was free and open to the public. Watch our home page for announcements of future events. Pruning is a challenge for most of us. But if you how a particular kind of rose grows, you’ll know how to prune it. The most important question is whether it blooms once a season or if it reblooms after the first flowering. Modern roses—hybrid teas, grandifloras, floribundas, and modern shrubs and modern climbers—all repeat. So do some old roses, but many don’t. If you are pruning a one-time bloomer, it blooms on old wood—canes that developed last year or before—so you want to leave a lot of old wood until after it flowers. If it’s a repeat bloomer, it blooms on wood produced in the current year. On repeat bloomers like hybrid teas, promote new growth by pruning in early spring. To quote Jekyll again, “The more a rose plant is pruned, the stronger will be the shoots that result from this apparently murderous treatment.” That seems strange, but the root system in spring has a given amount of energy and ability to take water and nutrients from the soil; the more bush you leave unpruned, the less energy is available for new growth. Thus, the weaker the plant, the more you cut back—and vice versa, the stronger the plant, the less you prune. Pruning is easier if you study how roses grow. New growth comes from bud eyes, the places where a leaf was attached last year. In early spring you’ll see a bit of a bulge on the stem and a thin horizontal line with a little dot above it. New growth will come at the top bud eyes on a cane. If your bush is 5 feet tall, that’s where the new growth will start—and there probably won’t be much of it because the roots need to feed a big plant. That’s why you cut the cane back. Before you start pruning, have in hand sharp bypass pruners, long-handed loppers for stems over ¾ inch in diameter, heavy gloves with cuffs, and weatherproof Elmers glue. Then study the bush—what do you want it to look like? Better air circulation helps prevent disease, so you want to end up with a balanced bush with an open center. For a hybrid tea, you want at least three good canes, more if the rose is strong. If you want roses for exhibition, prune hard and you’ll get fewer but larger flowers. If you want a lot of garden color, prune a little higher for more flowers, smaller with shorter stems. If your emphasis is on color, you’ll want to prune a hybrid tea to 12 to 18 inches in height. If it’s been a hard winter, you may have to cut lower. a. Small, twiggy growth—anything less than pencil thickness. b. Dead wood or wood with dark spots—cut back until the pith is light colored. c. Canes that are crossing or rubbing, or canes that crowd the center. d. Try to end up with the height you want and the number of canes you want, but the most important thing is to have a healthy bush. Make your cut ¼ inch above a bud eye at an angle away from the bud. The bud eye should face in the direction you want the new stem to grow—usually away from the center. Cuts at the base of the bush should be made cleanly without leaving a stub. Seal your cuts with the waterproof glue to prevent borers from laying their eggs there. Floribundas vary in growth habit, but in general they stay lower than hybrid teas and with more branching. Leave as many healthy canes as you can, and don’t cut quite so low. Pruning is not a one-time job. Look again a month later and prune back any shoots that you optimistically thought would grow, but didn’t. Keep watching for dead or diseased growth all summer. When you deadhead, you may decide to shape your bush too. Just be sure to stop cutting back before fall so the bush is not encouraged to send out tender new growth late in the season. Tender new growth will not make it through the winter. Viburnum — one of the most outstanding and popular group of flowering landscape shrubs — is a genus of about 150–175 species of shrubs or small trees in the moschatel family, Adoxaceae. They vary in size from 2 to 30 feet and have glossy, leathery foliage and striking, fragrant flowers, primarily white in color, borne in clusters, often in a rounded snowball shape. It’s a wonderful shrub for our Hudson Valley gardens. Bloom times span early spring through June and are followed by a second season with attractive fall foliage, and showy, changing fruit color when the berries ripen from green through pink or yellow to blue-black. And viburnums are hardy, pest-resistant, adaptable to a variety of soil and environmental conditions, and require little pruning. Although flowering and fruiting are more profuse in sunny situations, they’ll grow in sun or shade. 1. Moisten some sterile planting medium. 2. Cut a healthy stem from an existing shrub and remove the lower leaves. 3. 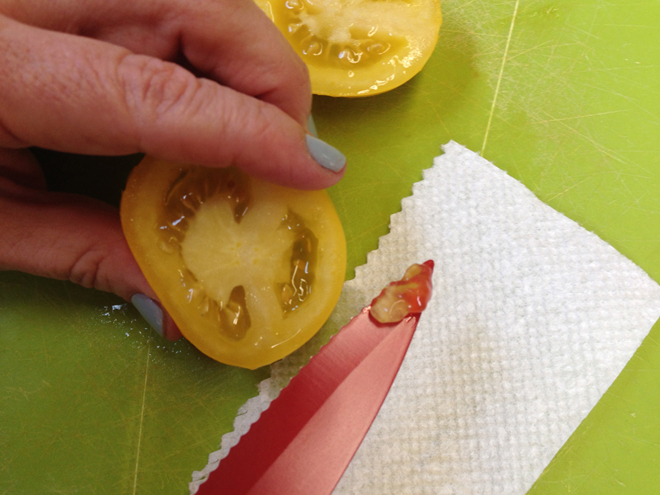 Cleanly slice the stem with a single-edged razor blade and dip the end into rooting hormone. 4. Pot the cutting and tent it in plastic. Place in a protected spot. Each workshop participant prepared 4 to 5 potted cuttings to be grown at home until they’re healthy, robust small shrubs ready to be judged on a point system at a Zone III (New York State) Plant Exchange. Every Garden Club of America flower show has a cut specimens division. Visitors love viewing cut branches and stems of trees and plants currently in bloom. Cut specimens in bottles make wonderful decorations at home, too. They’re the perfect, easy way to enjoy the blessings of your garden on a windowsill or dining room table. And often a single stem is more dramatic and compelling than a whole bouquet. 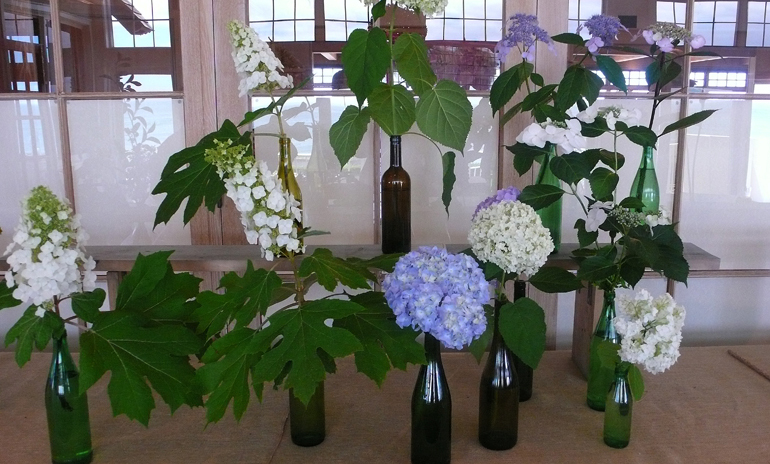 One journalist who visited the East Hampton Show last summer (pictured above) wrote that she was so inspired by the cut stems in the horticulture division she went right home to make some for her windowsill. Rules of thumb for success: look for blossoms with the wow factor, have appropriate bottles ready, condition plant material to minimize bacterial growth and maximize water absorption. To minimize bacterial growth, use fresh water, clean clippers, and immaculately clean bottles. Keep your eye out for interesting clear and tinted glass wine bottles. One club member collects tall, slim wine and liquor bottles and bottles that once held bath salts, fancy vinegars, and other gift items. She puts the containers through the dishwasher, then fills with water, adds a small amount of liquid bleach, and leaves for 15 minutes. When she finds the perfect branch or stem, an ideal container is ready for it. A preservative must be added to the water in the bottle. Some people are loyal to Floralife, but others have good success with this method: fill a quart measuring cup with room-temperature water. Add one teaspoon of vodka (not rubbing alcohol) OR one tablespoon of sugar to the water. Then pour the water into the bottle you will be using to display your stem. Before placing your stem in its bottle, re-cut it (some people swear by re-cutting underwater, such as in a bucket of warm water). Make sure no leaves are under the water surface and trim off any slight imperfections on the foliage. Stand back and admire from all sides. And you can decoratively plug the top of the bottle with leaves to minimize evaporation. 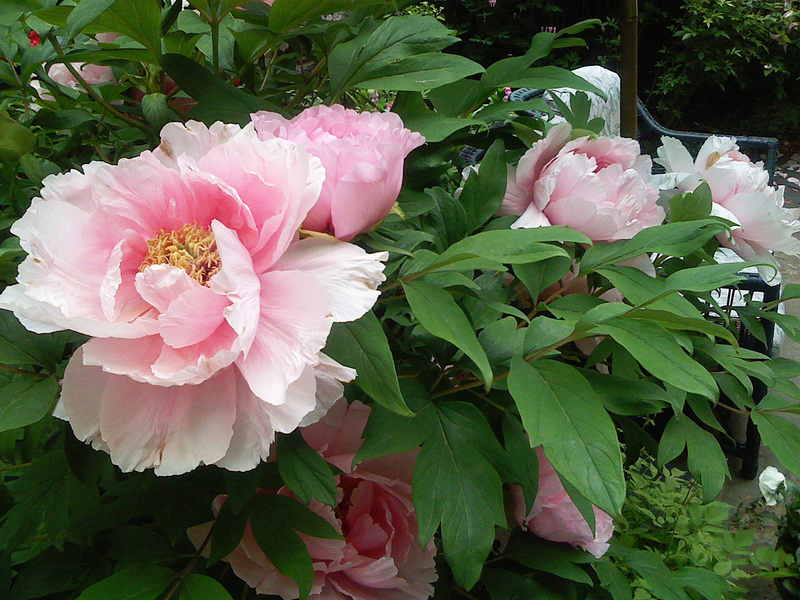 In the garden of Renee Shamosh, a Japanese tree peony that blooms before the herbacious varieties. Plants like this tree peony will reward you year after year with spectacular blooms, if you give them a little loving care. Now is the time to remove any remaining debris—fallen leaves and old mulch—where pests might be harboring (if you see ants, they are harmless). Plant in the fall (October 15 is ideal in the Northeast), but a little TLC in the spring will assure a long-lasting, deer-resistant succession of blooms from May through early June. La Pivoinerie D’Aoust Nursery in Quebec City is a great source of information, mail-order plant material, even instructional videos and tips on photographing your garden.